Well, today Barnes & Noble(NYSE:BKS) has unveiled the newcomer to their nook product line, the NOOKcolor. What has been generally anticipated as the latest round of one-upsmanship in the Kindle vs nook competition has taken an interesting turn, to say the least. People following the news have heard rumors about it for the past week and even seen a prematurely posted accessory sales page that only lasted a short while, but now we have some answers to the questions these rumors raised! How will they pull off the color? For the past week or so this has been the big one. Everybody was curious how, if the rumors that there would be a color touchscreen nook were true, B&N would manage things. There was speculation regarding those amazing Mirasol displays that act like eInk in a lot of ways but won’t be out until 2011. Sadly, nothing of the sort was in the works. I don’t think anybody really thought it would be, since it would mean missing the 2010 holiday season and the resultant revenue, but there was some hope at least. Instead, we’re getting an LCD on an eReader. I can only think of two possible reasons that they might have gone this route, ruling out a desire to cash in on the novelty as much as possible before pulling out of the eReader game. One, their LCD is so altered by the addition of a lamination layer to reduce glare from both the back-light and outside light sources that it will revolutionize portable LCD technology in the short term while better technology becomes available. I honestly wouldn’t mind this much, however unlikely it is. I don’t like the fact that LCD displays eat up battery life so amazingly fast by comparison with eInk, but my main objection has always been eye strain. Reading for hours on a normal LCD hurts, especially when you have reason to do it regularly. That said, this one seems somewhat far-fetched. Until somebody has had some time with a NOOKcolor of their own though, not much can be said for sure. Two, and far more likely in my opinion, this is intended to cater far more to the tablet fad that’s taking over the market at the moment than to have much to do with reading. I’m not going to deny the potential usefulness in grabbing kids books and cookbooks and the like, but does that really justify the extra expense and inferior reading display? Not really, but an app store just might. This leads into the next line of speculation answered. This point is in B&N’s favor, I’m sure, in spite of the loss of 3G access. Many nook owners have been somewhat disappointed in the lack of app development for the nook so far, given its Android platform and interesting potential. Short of rooting your eReader, however, the closest we’ve gotten to apps is sudoku and a web browser. Nice, but not really anything to write home about. the new NOOKcolor, though, will ship with Facebook and Twitter integration, a request feature for the popular LendMe setup to let your friends know you want their books, a Pandora Radio app, some degree of Microsoft Office compatibility, and even a new crossword puzzle game! Ok, so the crosswords aren’t a big selling point, the rest is cool. On top of that, there is to be a nook app store that they are now taking developers on for in order to maximize the potential for users. This is very cool, and means a lot in terms of long-term viability of the product. This is quite possibly the hardest question to answer. Mostly because B&N has set themselves up in an odd sort of in-between space. Yeah, they still want to be an eReader and are clearly highlighting features that match or exceed the Kindle as a selling point. At the same time, however, they also clearly want the option for some iPad-like functionality and diversity of purpose. So where do we make the (nook vs. iPad) comparison? I’d say we’ll have to wait for a chance at some head-to-head functionality tests after the first units ship before a real evaluation can be made. Right now it feels like a shot in the dark to try to beat Amazon to the punch on color eReaders and address the crowd who still see the iPad as a part of the eReader competition. The features are all there for books, of course, and the potential seems plentiful for app development, but the compromises in terms of price and technology make me wonder. In short, it’s an odd situation. the NOOKcolor looks cool. It really does. Is it really an eReader anymore though? I’ll admit that color touchscreens seem to be the way of the future, but there seems to be a chance that Barnes & Noble jumped the gun here and put out their entry into the market before the available screen technology was ready for it. eReaders have been characterized by their amazing battery life and easy to read screen. It’s that combination that has set them apart. To throw that off is to take a gamble, in my opinion. I hope it does well as a tablet device, but the Kindle might have lost its biggest competition. I will, as always, caution people to avoid making too much of early speculation before the product even becomes available, but the indications are there and we can only do our best with the information we have available at the moment. Give it some thought. This might fill exactly the niche you’ve been looking forward to, personally, even if it isn’t what we might have expected. This entry was posted in E-Book Readers, Kindle Competition, Kindle Killer and tagged B&N, Barnes & Noble, Nook, NOOKcolor by matthew. Bookmark the permalink. B&N likes putting out inferior products after the market leader; first they try an e-reader after the Kindle, and now they try the NookColor after the iPad. I can’t wait to see what inferior, second-rate product they release next. What’s the casing mod in the bottom left-hand corner of the NOOKcolor? I can’t figure out if it is hollow (a loop or something) or just some exposed white on the casing. Obviously any discussion about this device is early speculation, but I do want to congratulate B&N. I suspect they will get some major buyers of this new creation, but probably cause quite a few NOOK regular users to stay with their devices (due to the firmware upgrade). I won’t buy one. I won’t even look at one, but I suspect many people will. As for me, I’m sticking with my Sony PRS-650. The Nook Color will not run apps straight out of the Android Market, but that does not mean it cannot run them. In fact, they have done a lot of tests on apps from standard Android smartphones and they pretty much run on Nook Color, which has Android 2.1 under the hood. (The Nook native interface and apps are just standard Android application layers.) 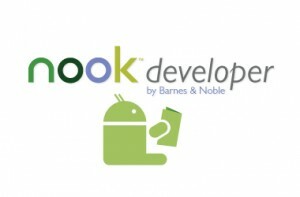 Barnes & Noble special Nook SDK runs on top of the standard Android one and gives developers access to exclusive extensions and APIs for the Nook and its interface. So porting Android apps is not difficult. B&N says it is more like optimising them for Nook than porting them. Nook Color screen is supposed to be better (less reflective) for reading than iPad. Disagreed. What you consider inferior is based upon what you have purchased for yourself. As a nook owner, and having had the chance to use both Nook and Kindle, I can state that they are both good readers and both do the same thing, really, albeit in different ways. Oh yeah, I’ve attained epub books from 8 different online vendors. The nook color is a transitional device, which will eventually pave the way fro BN’s Mirasol based reader, whenever it comes out. At that point, any reader, Kindle or Nook, will be superior, and there won’t be a need to compare. What is all the negative comments about a product that you have not seen yet? I had had all the nooks and Kindle, the latest Kindle is amazing but it is not suited to browse the web. Now what on earth is bad about a reader that can easily surf the web and let you read your email @ 1/2 the cost of and Ipad. I also purchased the Ipad two times and returned it both times. I still think that purchase must fit the audience! If you need to run apps then buy the Ipad it is an incredible device. If you want just an ereader, the new kindel is fantastic but just an ereader. If you want more (like me) then you buy a laptop. Needless to say why bash someone else party? 3G isn’t that important to what B&N identifies as their value prop. When I’ve talked with people who like Nooks, one of the big things that comes up is that they like to sit in the B&N store and read stuff on them. The thing has b/g/n wireless, which is pretty common these days, and a full-blown browser so you can sign on to wireless in places that use a web-based front end to their access point. as for color and reading time, the real comparison has to be with the iPad. 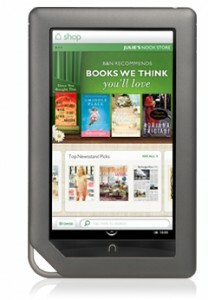 Nook will lose head-to-head on features every time, there, but it will win on price. $250 is basically loss-leader, and if B&N gets their heads out of their nether regions w.r.t. Android apps, it will be able to compete on features. Readability on color is kind of a red herring in these discussions. Reviews of Kindle and Nook apps for the iPhone and iPad almost universally note that readability is excellent, and in many ways subjectively feels better (note the brighter whites). Objective tests may find slower reading on the color screens; it wouldn’t surprise me, but it would also not be the first time a product with poorer objective performance won out (remember the PC Jr’s chiclet keyboard, which on paper was faster than a regular keyboard?). Oh, yea, battery life — how does it compare with an iPad? The unknown here is whether the usage profile will be more like an ereader or an iPad/netbook. It’s not that it’s not a gamble; it’s a gamble. But I don’t think it’s that big of one. It puts them into the leading position. We can be pretty sure that really good low-power color will be production-ready in about 6 months, which means that the next wave machines will have much better battery life. But that will be across the board, as netbooks will be kitted out with those, too. If the Kindle could browse the web….it would be a contender to the Color Nook. It cannot. Can you read books comfortably on the Color Nook? Yes. Is its screen as good as Kindles? Perhaps not…BUT it will surely be good enough. Since the Kindle cannot browse the web.. and built in browsing capability can only be an asset….a big upside for the Color Nook. Anyone and everyone may easily find a time when they wish they had internet access NOW! End of competition. End of story. 2) Do you honestly believe that there is a shortage of browser-capable devices on the market or at consumer households? It’s not 2007 anymore.